Mac Users: From Go, choose Connect to Server, enter :"smb://storage.wpi.edu/software/EndNote/Mac/x9"
**If prompted for a username and password, enter admin\username in the username field, and your WPI password in the password field. For installation assistance, please contact the WPI Helpdesk. Click on Find Full Text in left hand menu bar. Check the Open URL box if unchecked. Choose EndNote >> Preferences from the toolbar. To check for full-text, you must first open a reference in your EndNote library. Click on References, Find Full Text. It should retrieve the full text if available. If not, you can try References, URL, Open URL to get to the FullText Finder window with retrieval options. For items we do not have access to, you may need to choose Request (ILLiad Interlibrary Loan). Connect to WPI Library Catalog Under "Online Search"
To set up the WPI Library Catalog connection in order to search for books, project reports, and items within the WPI library collection from within EndNote, follow these steps. Download the WPI connection file. For Windows, Save this connection file in the Connections within the EndNote folder: C:\Program Files (x86)\EndNote X9\Connections. For Mac, save the connection file in the Connections folder: Mac HD/Applications/EndNote X9/Connections. Within EndNote choose Edit from the file menu, Connection Files, then Open Connection Manager. What's the Difference between EndNote & EndNote Web? How do they interact? EndNote Web is a web-based citation management tool with fewer features. 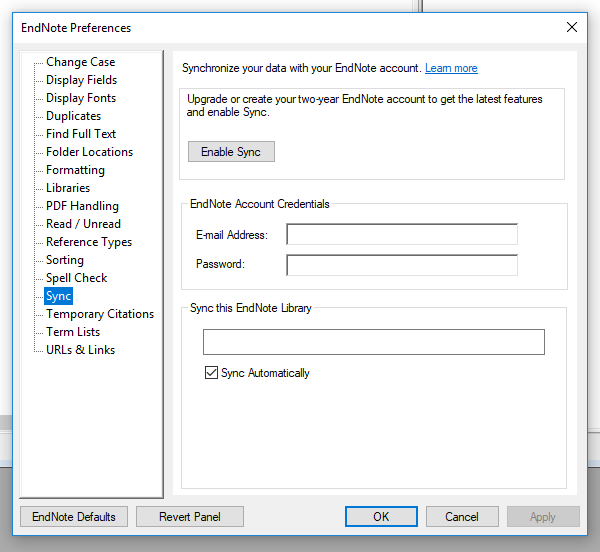 EndNote X9 users, within Preferences, can connect to and even upgrade their EndNote Web account. We suggest you upgrade to enable more features such as access to PDFs within their online libraries. ENW is a great option for serious researchers who wish to share parts of their personal EndNote libraries with others. EndNote Web compliments EndNote and allows sharing of references with other EndNote Web users. EndNote X9 groups (except for smart groups) are synced within EndNote Web.